Most of your health information should be learned either from your vet or from some of the resources listed in Helpful Links / Books. This page, however, is where information will go that we feel is necessary to communicate. For anyone researching possible human infections from pet rodents take a look here. The CDC has a page specifically for Rat-bite Fever. In 2016 we started treating all new rats with doxycycline for two weeks to drastically reduce the possibility of RBF. Get yourself a scale. Obviously many will work, this one has a handy bin you can place your rats in. Weigh your rats regularly, weekly is ideal. One of the first indicators of illness can often be weight loss. Building a track record of weights can be very useful. 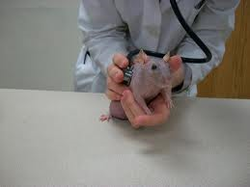 For girl rats: A spay can reduce mammary tumors by as much as 70% in girls. Next to respiratory complications, tumors are the second most frequent health concern with rats. It could be helpful to feed Harlan Teklad 8604/8640 lab block or another with soy listed as the first ingredient. Girls can get as many mammary tumors as they have mammary glands. Though the initial cost can be substantial, we typically spay a girl that we have a tumor removed from because odds are good more will appear otherwise. Train yourself to listen for signs of breathing abnormalities. Frequent sneezing with no environmental changes or increased stress should alert you to listen more intently. Other noises such as congestion sounds should cause you to make a vet appointment. Open-mouthed breathing, gasping, running in a panic, hunched-over, puffed up posture with focused breathing all should be treated as an emergency. Listen to the low, clicking sounds on this next clip. This rat died from respiratory complications a day or two later. Here is an additional site for more information about rat sounds. ​This video is very useful to see what to look for in cases of respiratory distress. This mouse, Cotton, died a couple of days later. It was very unfortunate her passing, but it was helpful in a couple of ways. One was a reminder that rodents can go from fine one day to very sick the next. Another had to do with giving mice meds. Rats you can often hold and squirt meds into their mouth for them to swallow. Cotton died by aspirating her meds given in this manner. I have since learned that it's much better to scruff a mouse rather than try to hold and force med. Most mice will take meds right from the syringe but ones that won't take them will usually lick them no problems at all once scruffed. These videos show some things to look for in a rat with respiratory problems. Puffiness and labored breathing are big indicators to get treatment fast.